This summer I learned how to can fruit. A lovely and talented woman in my ward let me bring the kids over to watch her can peaches a few weeks ago (at great risk to all of her porcelain figurines and hand carved wooden decorations at child height). I asked a million questions, watched her technique, and then struck out on my own. I started out with peaches. 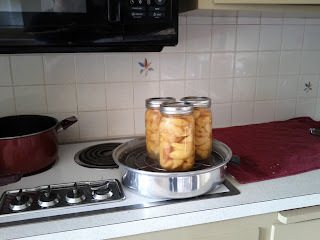 After freezing some, eating a lot, and baking a pie, I canned the remainder. 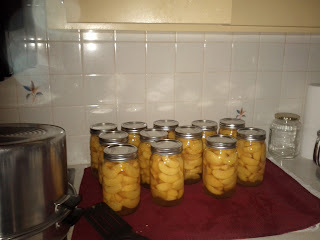 I am pretty sure a couple of my fingernails are permanently stained from peeling peaches, but overall I'm satisfied with the fruits of my labors. These were some really delicious peaches. 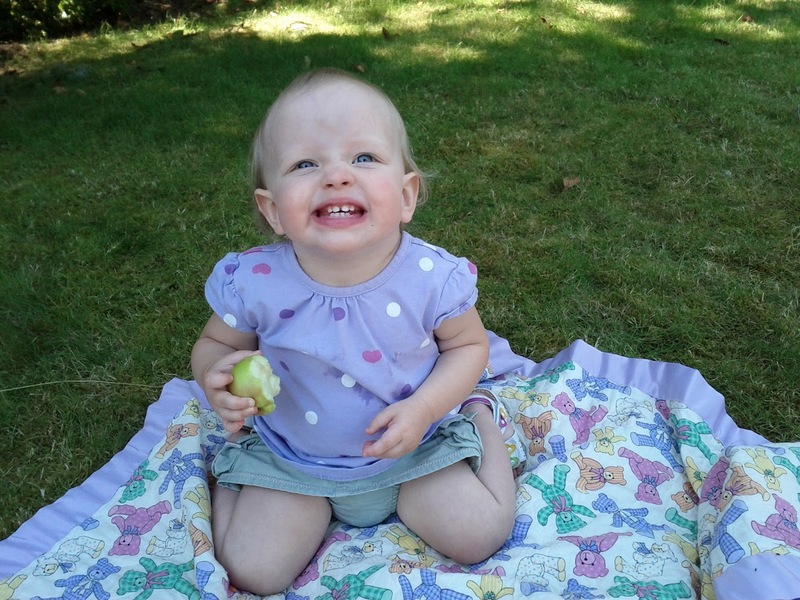 Washington is a major fruit exporter for a reason. 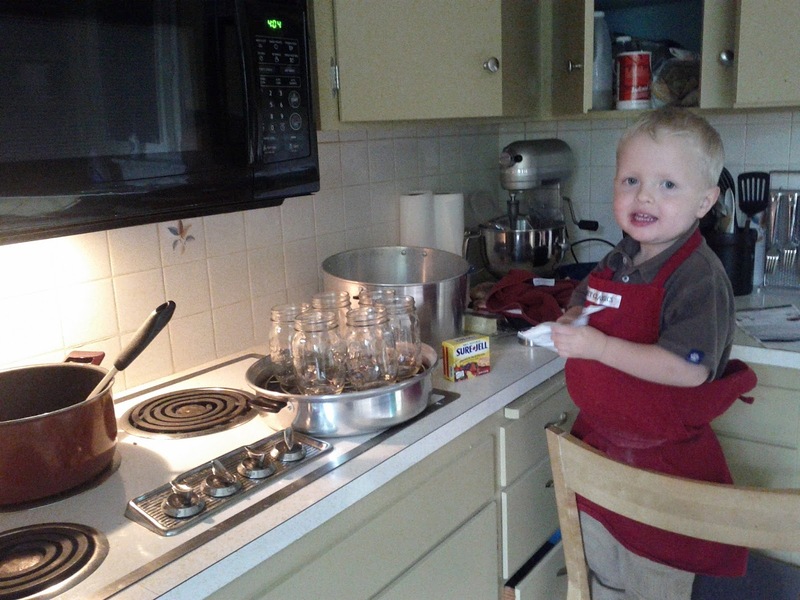 At first, canning made me feel really domestic. Fifty pounds of peaches, sixty pounds of pears, and two gallons of blackberries later, canning makes me feel tired. 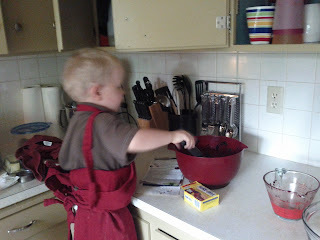 I think it was making pear butter that pushed me over the edge. After about fifteen calls to my sister, Cheyenne, who had success with the same recipe a month and a half ago, I started simmering pears. I cooked those juicy pears ALL DAY to try and get them thicker than applesauce. 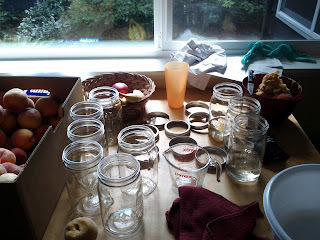 I think I drained off over a gallon of pear juice in processing. At 9:00 p.m. I gave up and decided to just can spiced pear sauce. 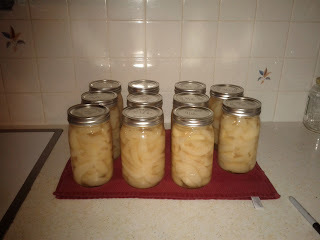 Here are the pears I canned the easy way. and licking the jam spoon while he watches for steam from the canner full of jars. Spoils! 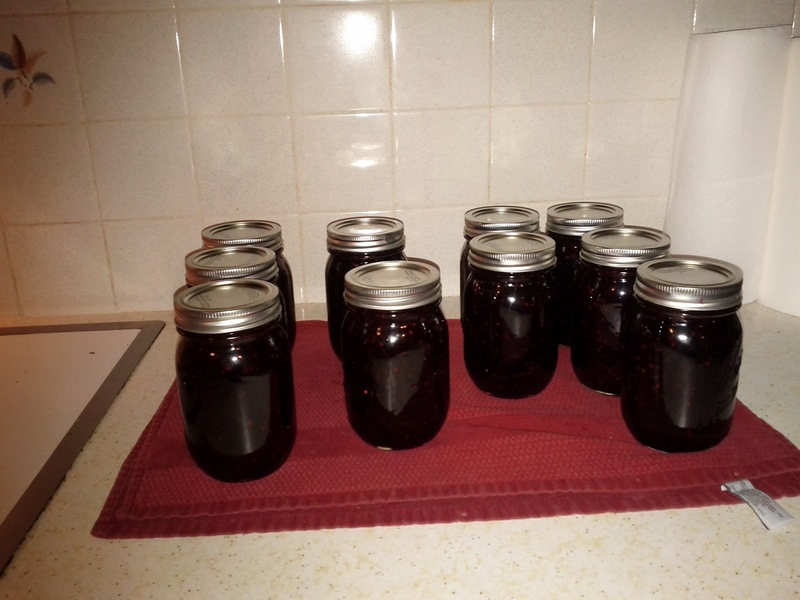 I wonder how long ten pints of blackberry jam will last us. 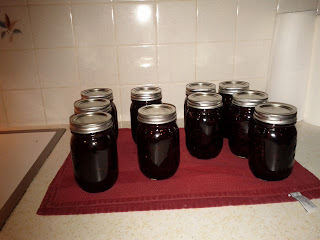 At the rate we are going through the container of jam in the fridge, we will need new jam by Thanksgiving. Whew. I wonder if I will ever get all of the sticky out of my kitchen. Now I can put my feet up until Baby Knight #3 comes, right? Only ten weeks to go! Summer is going, going, going, going, going. 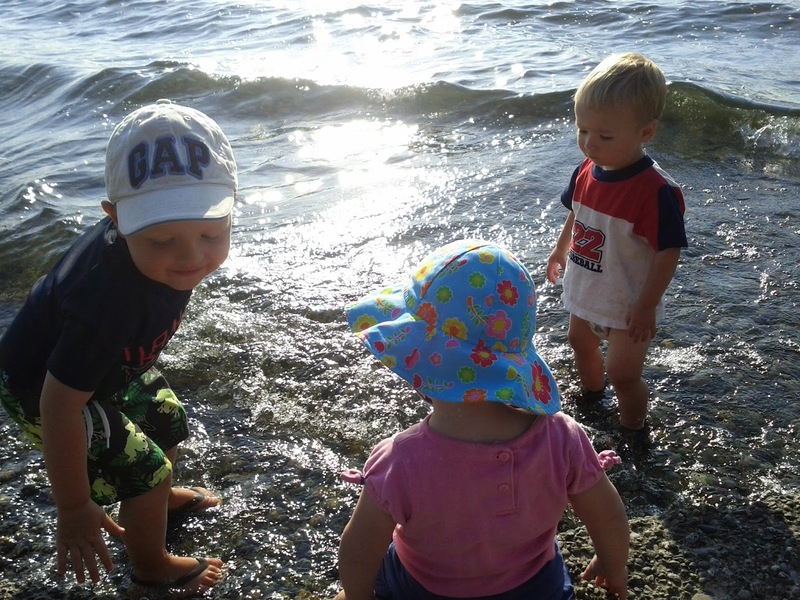 . .
At the turn of the month from August to September, we expected summer to be wrapping up. 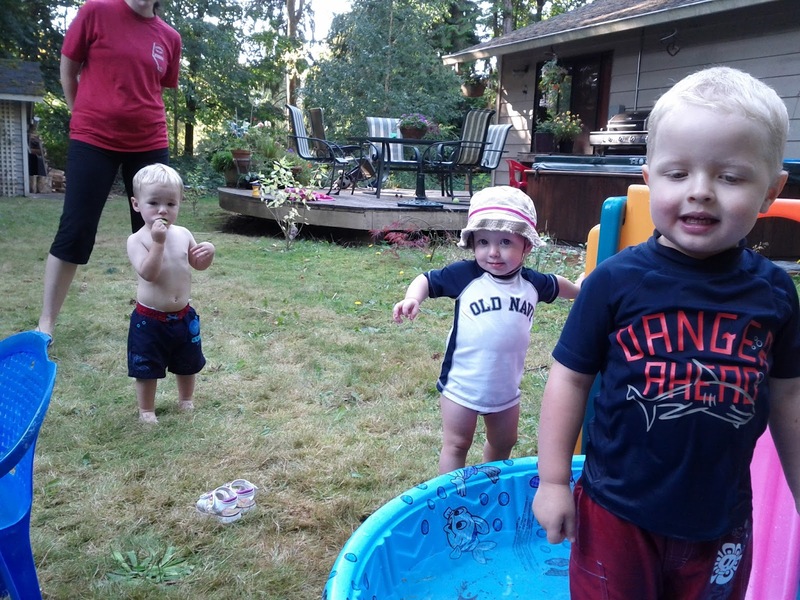 We moved here in September last year, effectively missing summer, since summer started exceptionally late in California, and lasted for about a week in August here. 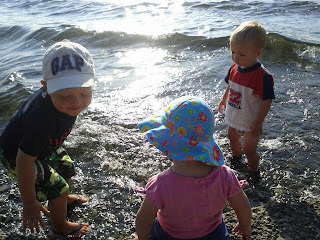 We have been pleasantly surprised as the weeks have gone by and we have had warm day after warm day. 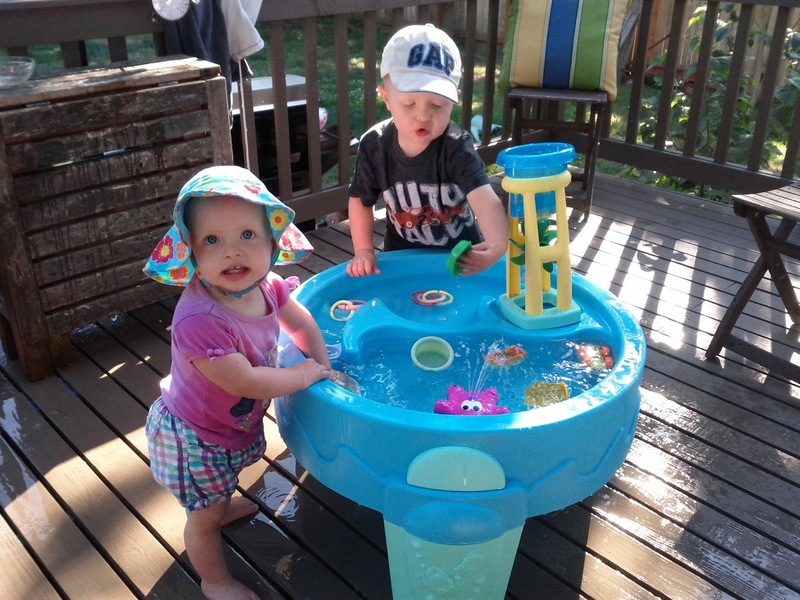 It was still warm enough on August 31 for Jared and Eloise to get themselves soaking wet in our neighbor's splash table at a neighborhood play date. 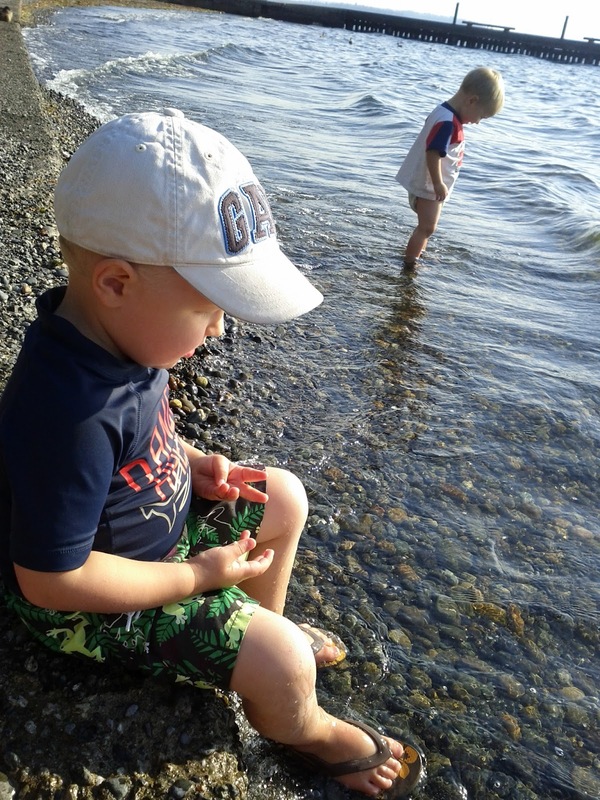 These two see water and forget about playing with friends. 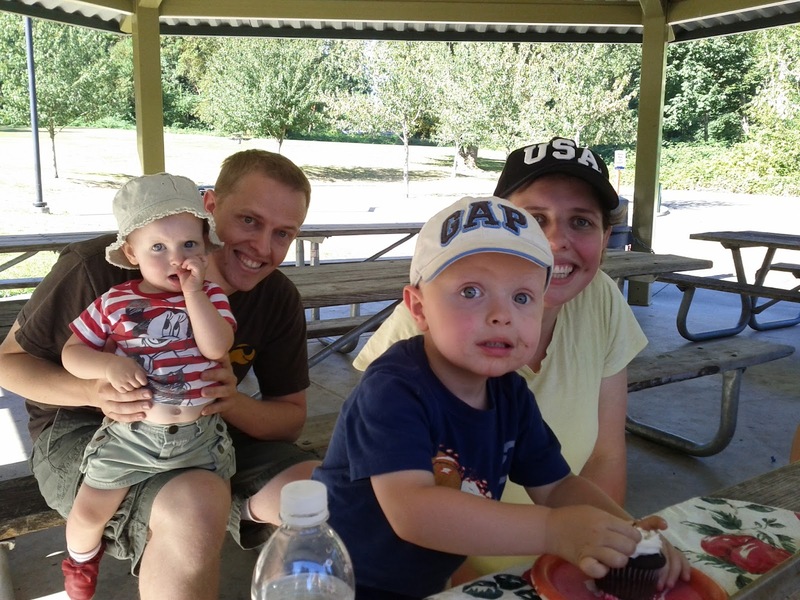 Our ward had a labor day picnic at the park, and the weather was still perfect. 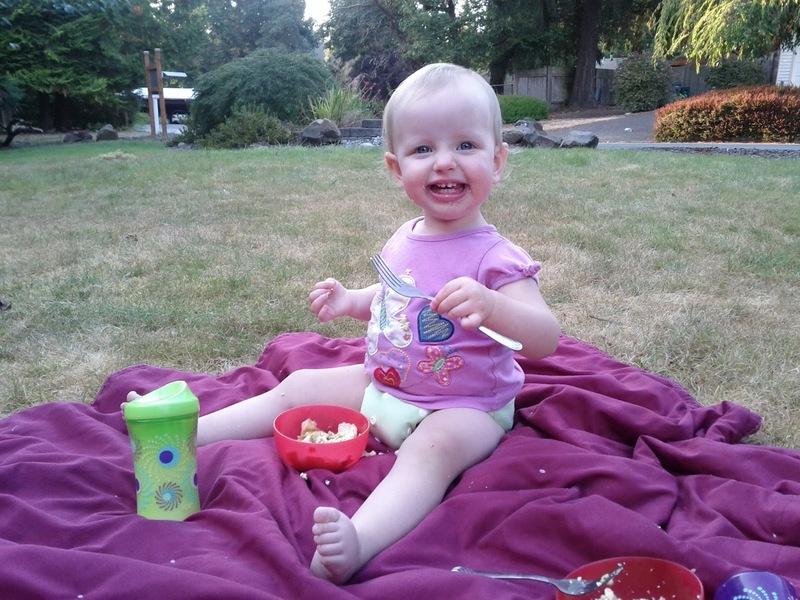 Two days later, the weather was still beautiful for us to pick some not-quite-ripe apples from a neighbor's tree and have a little picnic in the yard. Eloise loves to say "Apple!" She applies it to all non-banana fruits. With the sun still hanging on (45 days without rain- not a record, but still notable here), we spent a lot of time at the park. 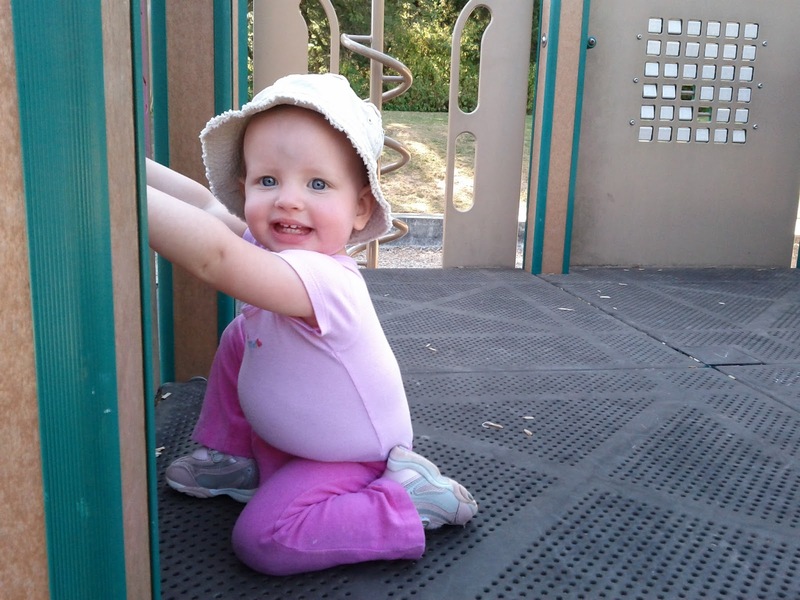 When we mention going to the park, Eloise always asks, "Park? Beach park?" 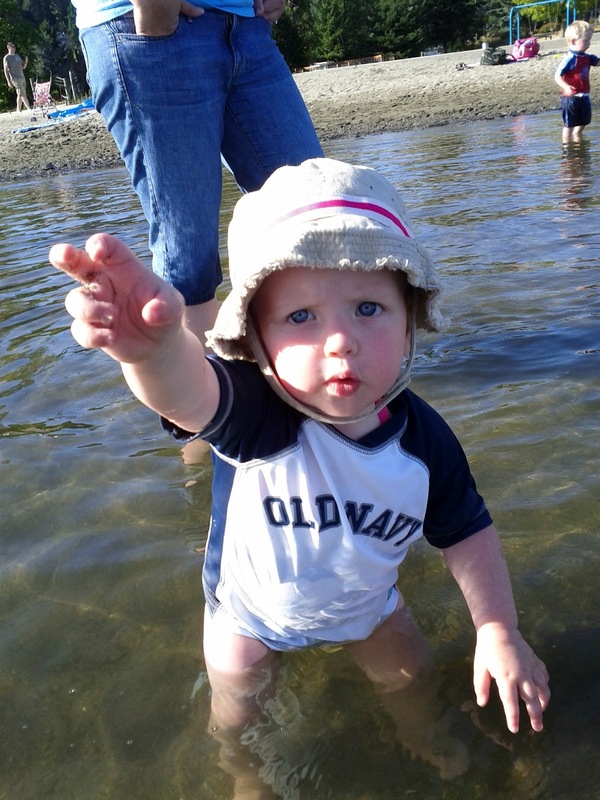 From the beginning of the summer when Eloise wouldn't even touch sand, much less frigid lake water, Eloise has made great progress. This is the deepest she ever went. This is her O face, as she says, "No!" As in, "No! Don't let go of my hand in this deep water!" Todd left us for a couple of days after labor day to go to Hawaii. 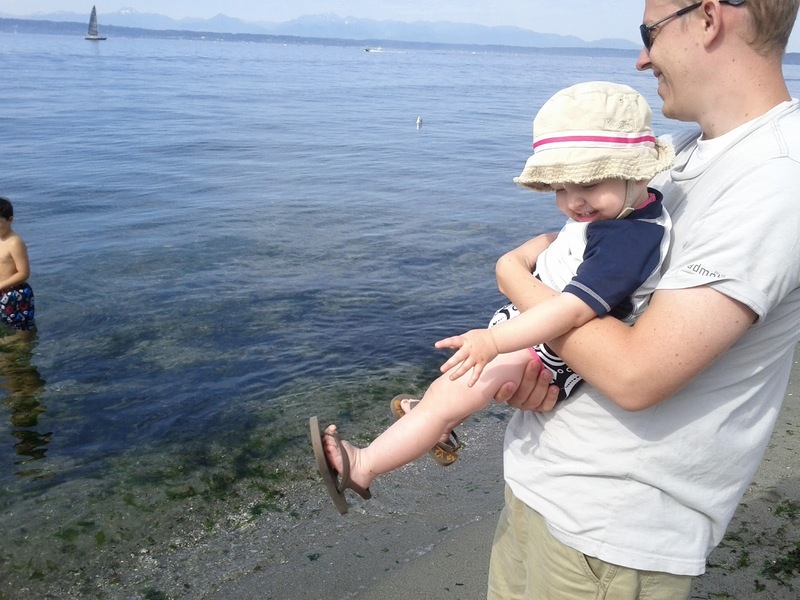 After seeing his pictures of his ocean view, Jared insisted that we needed to go to an ocean beach. The Saturday after Daddy's return, we drove to Seattle to Golden Gardens Park for a real ocean beach on Puget Sound. 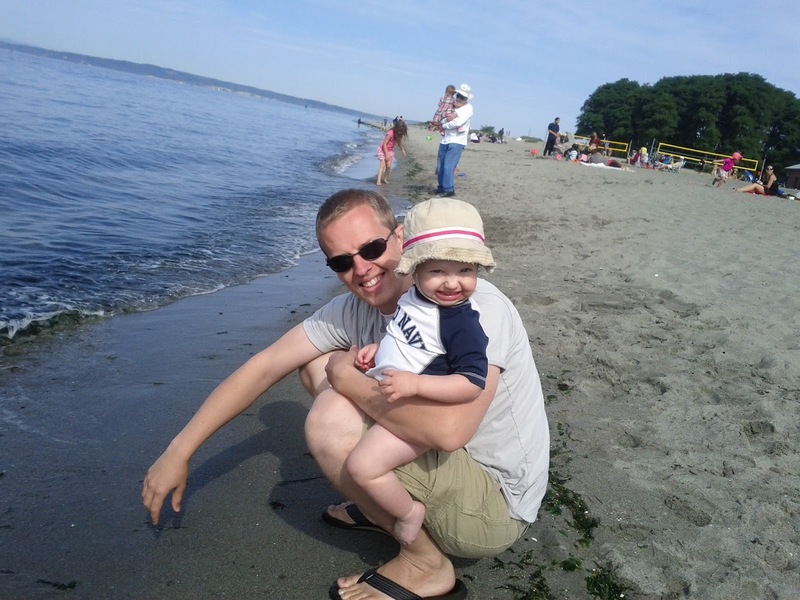 It was a little colder than I expected it to be at the beach. 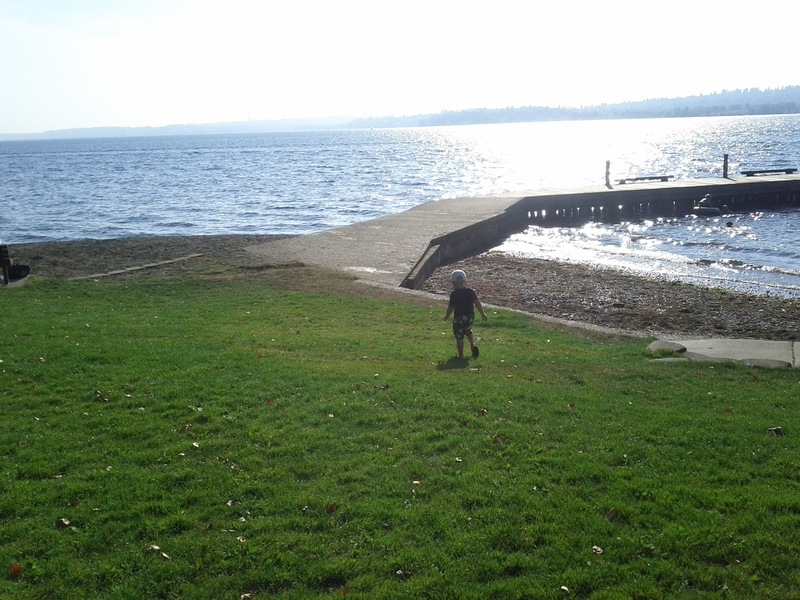 Notice how alone Jared is in the water. 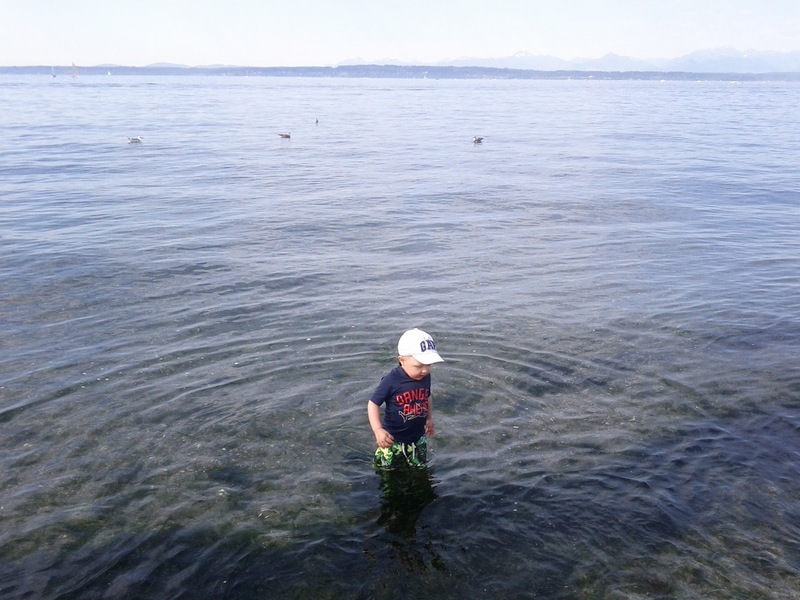 Eventually, a couple of much older daredevils came over to try and be as brave as little Jared in the freezing water. Eloise had no desire whatsoever to make contact with this water. She was happy to look after Jared's shoes for him while he turned blue. Eloise goes a little bit crazy over shoes. She LOVES them. 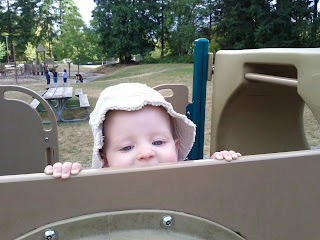 New favorite park game for the princess: peekaboo over the top of the playground. 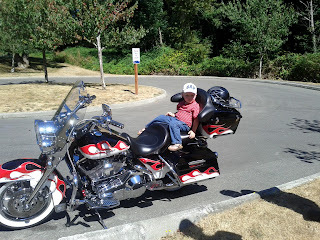 One day we were in the yard when a three year old neighbor came cruising by on his balance bike. 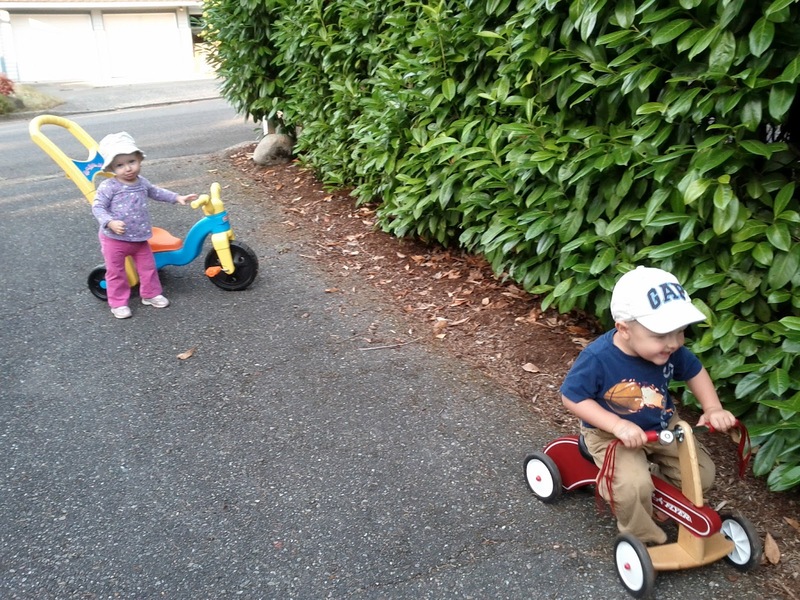 Jared and Eloise had to get their bikes out, too. 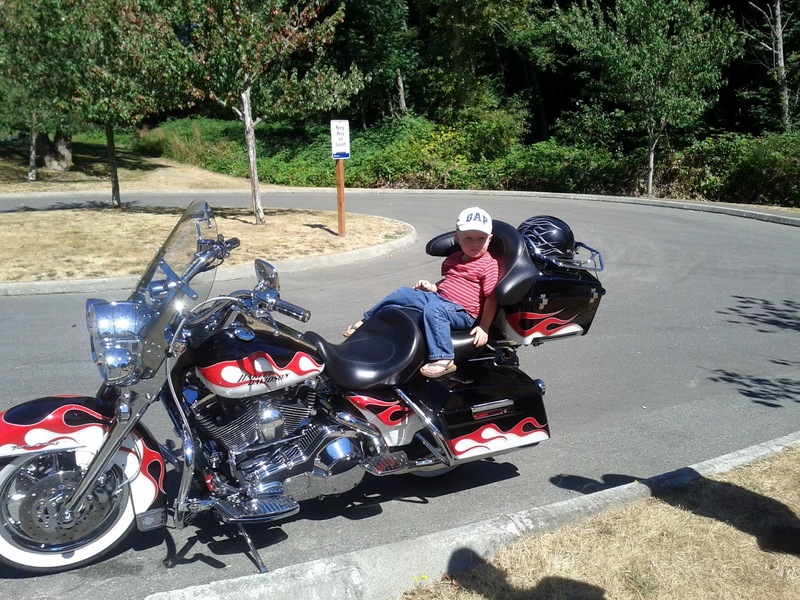 Eloise always kicks Jared off of the bigger bike, but he doesn't really mind. 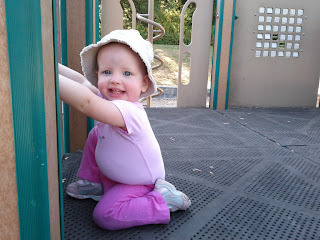 The middle of the month rolled around, and the weather was still amazing. One afternoon we picked up our friends Sabrina and Gray and took them exploring with us to Waverly Beach Park, where we had never been before. 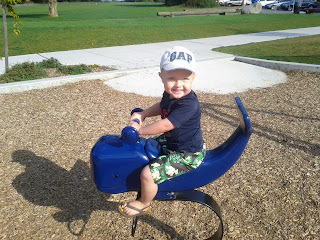 It is our new favorite park. We live in the most beautiful place. We have been spending a lot of time with Gray and Sabrina since they moved in a few blocks away from us. They are stranded without a car a lot while Gray's dad is job hunting. 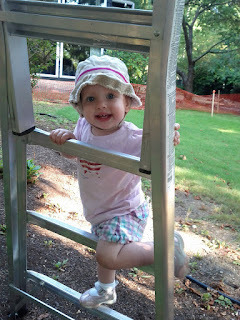 Eloise now equates all friends with Gray. She talks about him a lot. When we got home from the park, we had a picnic in the yard. Eloise ate. Jared ran around like crazy. 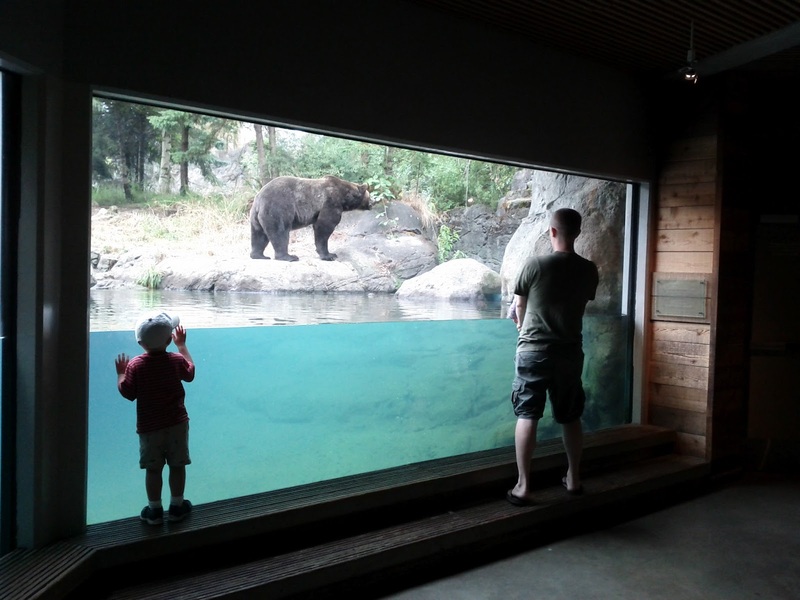 The next day we went to the zoo. 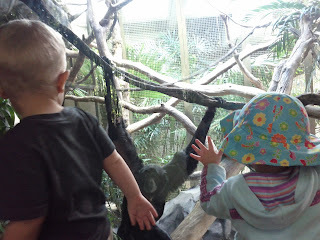 This photo was taken a second before the siamang swung into the glass in front of Eloise, startling her. This was the best we could do for a family photo at our last stop before we headed home. 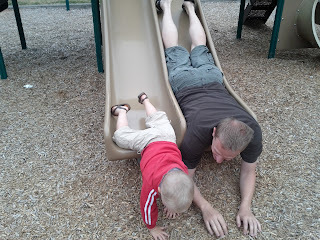 Some of us were tired. Okay, all of us were tired. We did a lot of blackberry picking from the wild blackberries that grow in abundance around here all month. We also went apple picking again on the neighbor's tree, but the apples still weren't ripe, so we only picked enough for a pie. 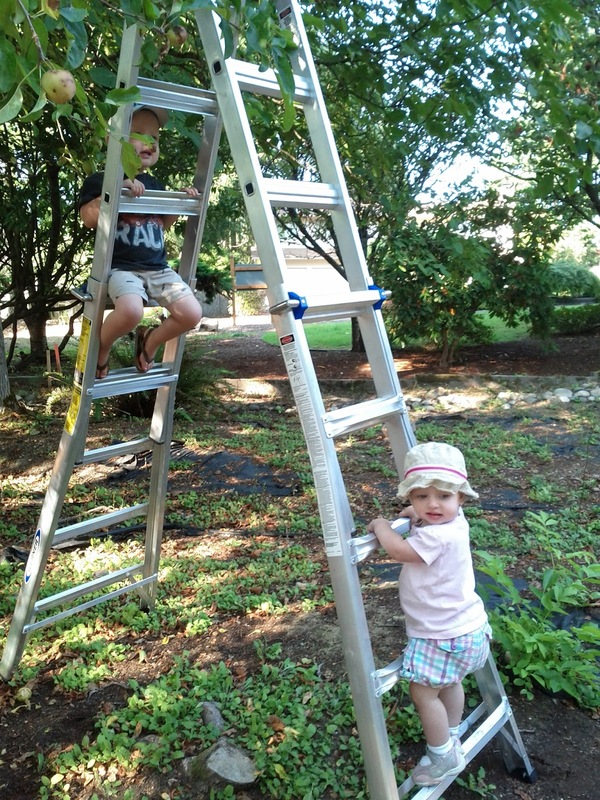 We mostly just played on the ladder. and one to Saint Edward State Park, which we had only ever hiked to before. 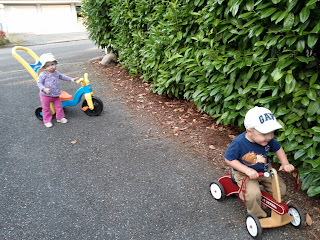 Pushing the stroller around the woods on the sidewalk turned out to be quite doable. Eloise likes to drive fast! Watch out for this girl. 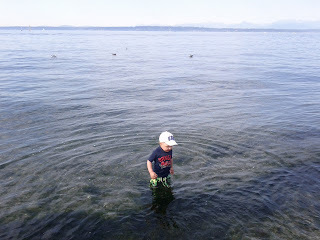 Finally, when we were sure that there was no sunshine left to be had in the Pacific Northwest, the weather surprised us again by producing one final swimming day. We went to Gray's house to play in his little pool. And, with that, September 22 arrived, and, for once, the climate got the memo. The autumn chill is in the air, rain has returned as an occasional guest, and we won't leave the house without jackets until summer rolls around again. 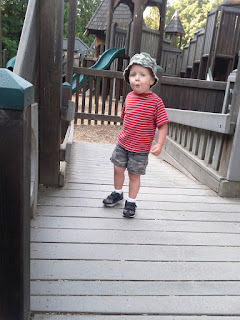 On August 21, our firstborn turned three years old. 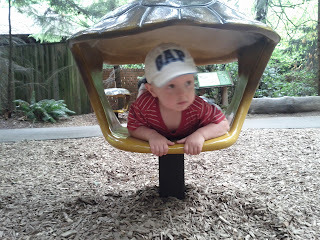 So before his birthday, we had to hurry and cram in one last visit to the zoo before he is too old to get in for free. 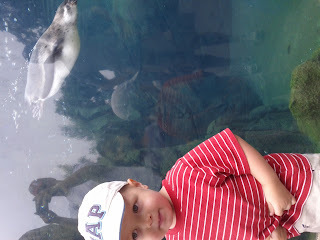 After our last zoo trip, Jared wanted to see the otters first thing. Unfortunately, the otters were dozing in their den this time, but the bears in the next exhibit were sufficiently entertaining. The second most important stop was at the bunny hutch, of course. 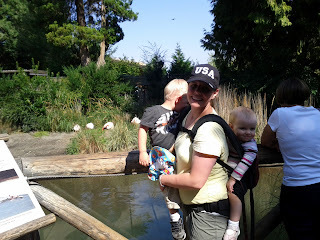 By the time we got there, a sleepy Eloise was just about done with the zoo. She was happy to drive the tractor, but that fun had to end sometime, and when she was done driving, she was ready to go. 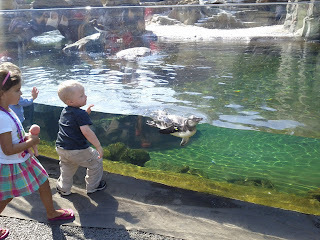 We just had one more quick stop for our turtle to visit his shell. . .
. . . and to say goodbye to the penguins. . .
. . . and then we could go back to the car, by way of the playground. 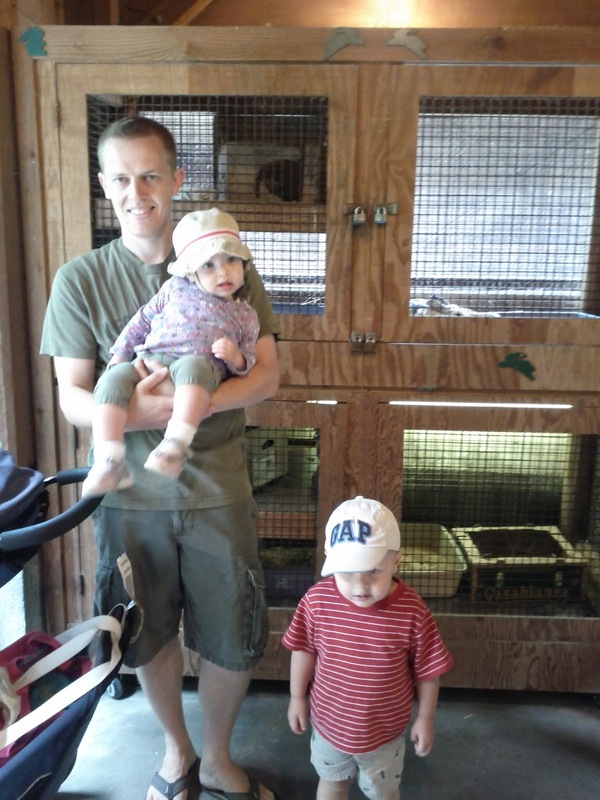 We still have our zoo pass until October, but we will have to go without Daddy, since Jared will have to use our extra pass from now on. Jared's actual birthday was on a Tuesday. 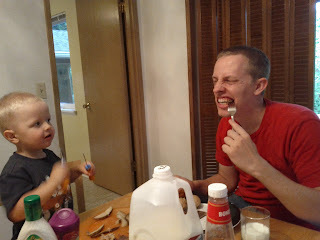 As he requested on Father's Day, he got waffles for breakfast and steak for dinner. 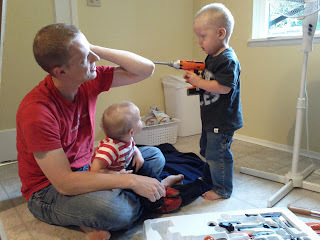 We had a play date with a new friend, Gray, in the morning, spent most of the rest of the day at home with one child or the other napping, and all woke up in time to pick Daddy up from work and drive to the toy store to pick up Jared's birthday present from Mom and Dad: a tool kit, complete with a battery powered drill. You can tell we are really on the ball with birthday shopping (not!). 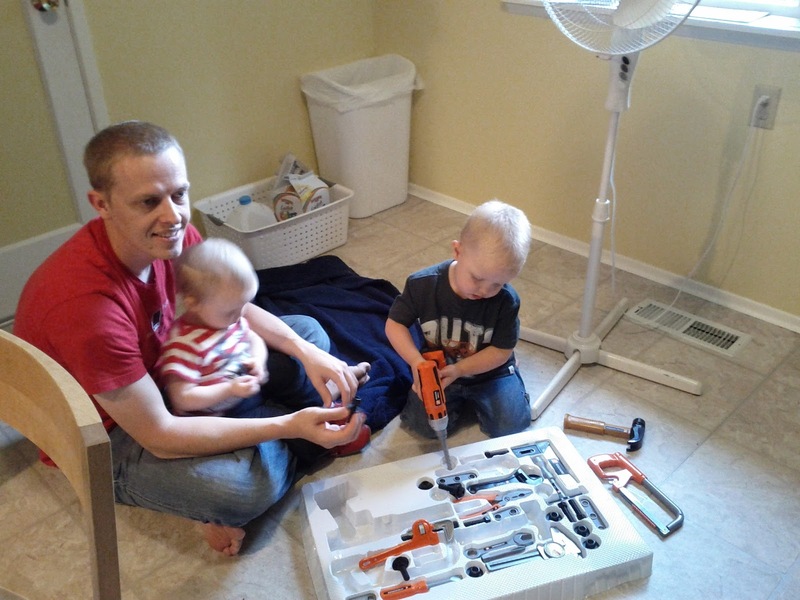 Jared opened it while I was finishing dinner, and got right to work fixing things. First he had to fix the packaging the kit came in. Then Daddy's elbow needed a little drill action. 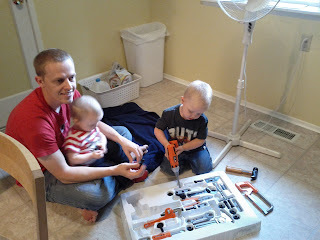 The tool set has been a huge hit. It has to be put out of reach at bedtime, or else it becomes a huge distraction. Jared and Eloise sit and play with the pieces for long stretches of time, allowing me to shower without anyone pounding on the shower door for a change. Eloise has even added, "Tool!" 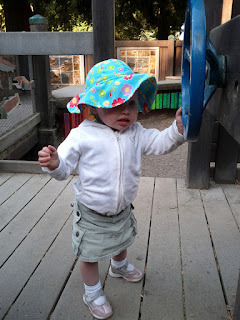 to her limited, but rapidly growing, vocabulary. Here is Jared with his steak. 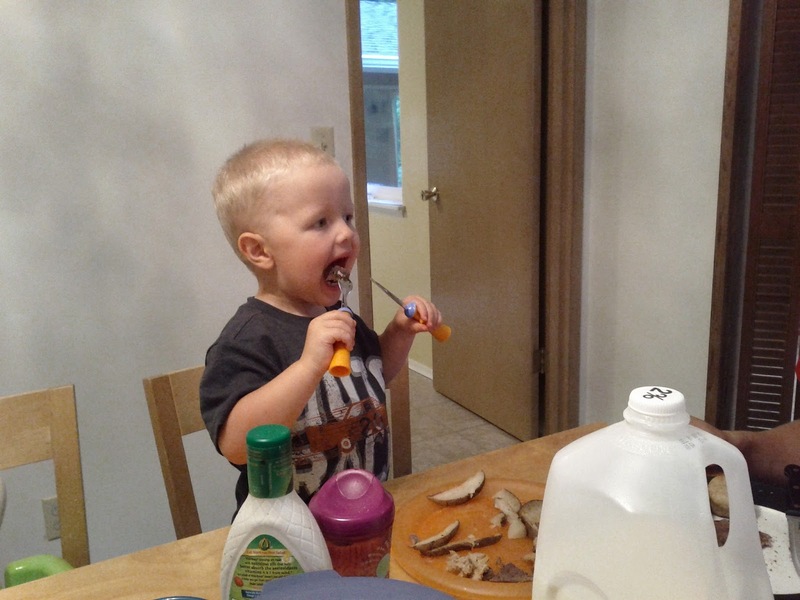 He informed me that he is old enough to need a knife at the table, now that he is three. This is how men eat steak. 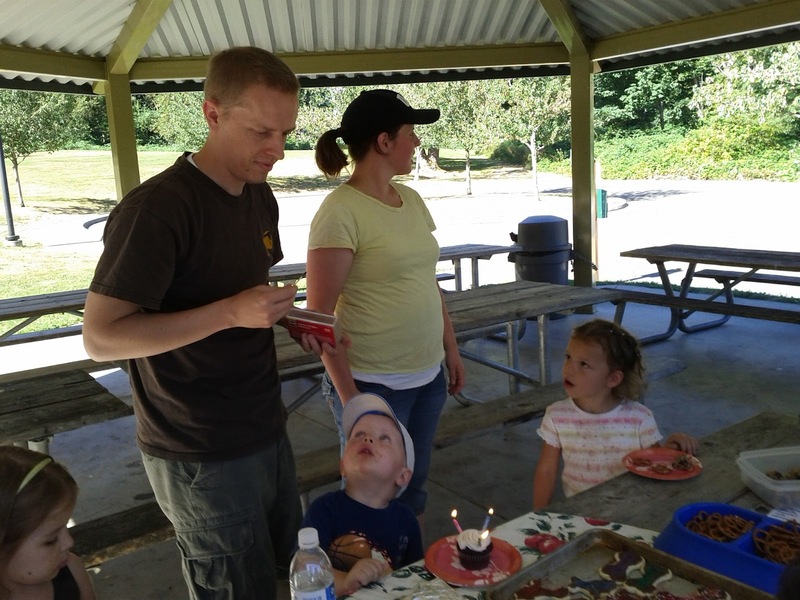 We had a birthday party for Jared the Saturday after his birthday. Jared wanted to have a dog party, so I made this impressionist dog dish cake, based on one in the book "Spot Bakes a Cake," which was the inspiration for the dog party. 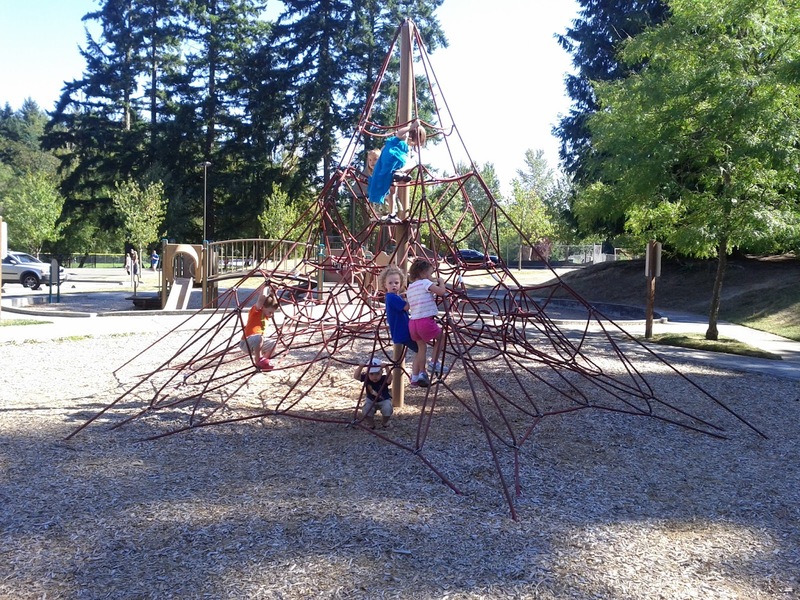 We were planning to have the party at the park near our house. We had everything ready, and we were loading up the car, when Todd discovered that our car wouldn't start. Apparently Jared had turned something on playing in the front seat while I took groceries in the previous day, and the battery had died. 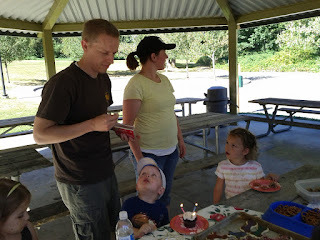 Our neighbor, Amanda, sent her husband, JJ, over right away to charge our battery, but when it was getting extremely close to party time and the battery wasn't charged yet, JJ offered to shuttle a few of our party supplies over the park for us so that we could make it on time. 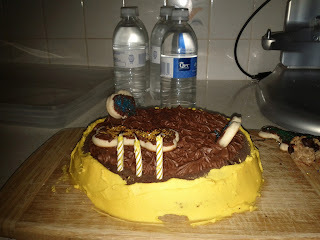 In the end, I decided that the cake would be too much of a hassle to take to the park, since the kids and I ended up walking over, and Todd already had his hands full. 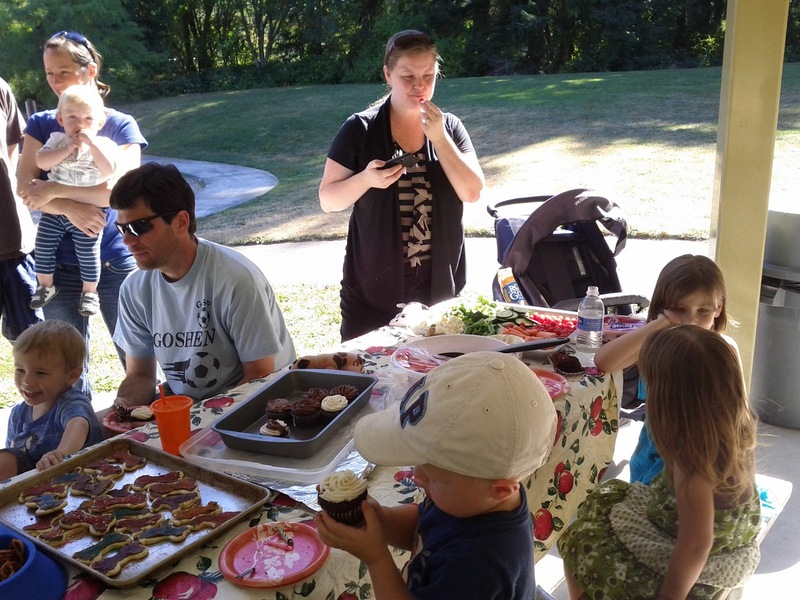 We had cupcakes, a vegetable tray, fruit salad, ice cream, and bone shaped sugar cookies, so no one missed a little bit more cake. One great thing about a party in the park is that it provides its own entertainment. 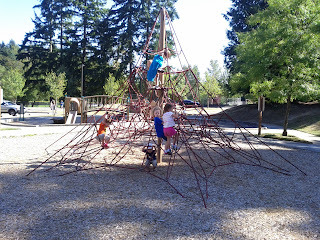 Here are most of our party guests (over the age of two) climbing the park web. The candles on Jared's cupcake stayed lit for about thirty seconds before he blew them out. Here is our family portrait with the birthday boy. It was a really beautiful day for a park party, and a great chance to get together with a lot of our friends. I can't believe how many great friends we have made since we moved here. Later that evening a friend came over and helped us get the battery in the car charged so that we would be able to drive to church the next morning. Thanks Eric! Jared is very proud of his new status as a three year old. 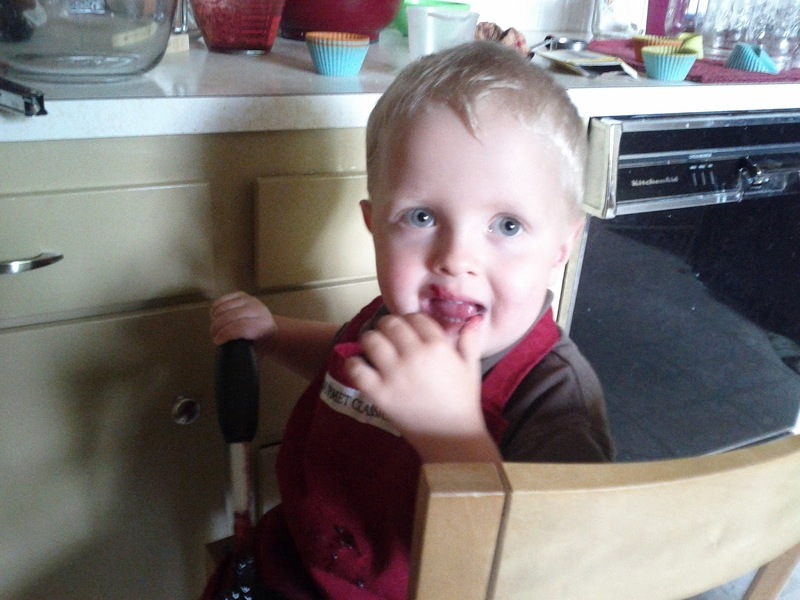 He frequently tells me, "I can do that myself because I am THREE." We took Jared in for a checkup shortly after his birthday. 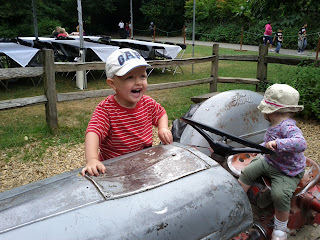 He was enormously relieved to learn that he isn't scheduled for an shots for another year. He had a great time asking the doctor a million and a half questions. At three years and two days old, Jared weighs 34 lbs., putting him in the 75th percentile, and is 37 inches tall, putting him in the 40th percentile. We couldn't be happier to have this inquisitive, smart, helpful boy in our family. Happy birthday, Jared!